A key element of recent government policy is that work should pay. It is also a longstanding feature of equality legislation that individuals performing similar jobs should not be paid less because of their disability. However, disabled employees earn on average between 10 and 20 percent less than non-disabled employees. Differences in personal characteristics such as age and educational attainment account for between 25 and 50 percent of this difference but this leaves a substantial unexplained disability related wage gap in similar jobs. The causes of this unexplained gap, particularly the role of employer discrimination, remain hotly debated. 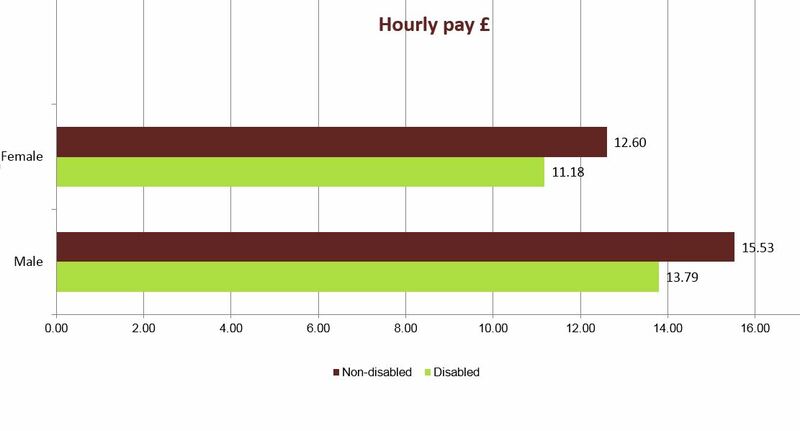 Research in the UK suggests in particular that skill mismatch (whereby the employee is more skilled than the job requires) is more prevalent among disabled relative to non-disabled employees and this contributes significantly to their earnings disadvantage. Jones, M., Latreille, P. and Sloane, P. (2006) Disability, gender and the British labour market, Oxford Economic Papers, 58(3), p407-459. Jones, M. and Latreille, P. (2010) Disability and earnings: are firm characteristics important?, Economics Letters, 106(3), p191–194. Jones, M. and Sloane, P. (2010) Disability and skill mismatch, Economic Record, 86, p101-114. Jones, M. (2011) Disability, employment and earnings: an examination of heterogeneity, Applied Economics, 43(8), p1001–1017.